WHAT IF MARVEL MASTERWORKED THEIR GOLD AND SILVER AGE CRIME AND WAR COMICS? Welcome to the What If? Library page joining together the two genres of comics where the brutal heart that can beat in the chest of man is most evident- when man chooses wrong over right, and when he must rise to kill an enemy combatant with his rifle, bayonet or bare hands! It's Crime and War, Masterworks fans! And one day, you may hold in your hands a book culled from the list to your right! 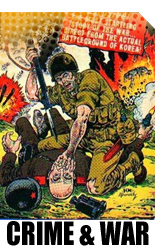 For violent comics drama of a global nature, we can turn to the many war titles that Marvel produced across the 40s and 50s. If battle is your appetite, Marvel can serve up a dish to satisfy! Look at all those comics with "battle" in the title! You got yer Battle Action, Battlefield, Battlefront, and Battleground, Young Men on the Battlefield and Marines in Battle! And when you're ready for something more simple, there's just plain old Battle! These war anthologies served up a heavy dose of combat realism and stories from creators who were actually there! On top of comics dedicated to the Marines and Navy branches, Marvel also created a small but potent stable of identifiable war hero comic lines, led by Combat Casey and Combat Kelly, and including other, more obscure men of war like Devil-Dog Dugan, Kent Blake of the Secret Service, and Sgt. Barney Barker! It's highly unlikely we'll see any of these comics lines get the Masterworks treatment any time soon- if ever! But as usual, it's nice to muse about such things, and at the very least, this page can serve as a broad overview of what available material is out there for these two genres. We haven't scratched the surface on providing all the maps and mockups for each volume, so check back over time for new ones that we'll be putting up.